The researchers captured the full demonstration on video recorded in both labs. The following version has been edited for length. This video and high-resolution photos also are available on the research website. 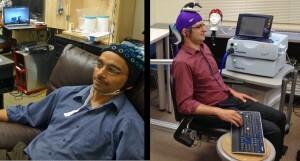 The technologies used by the researchers for recording and stimulating the brain are both well-known. Electroencephalography, or EEG, is routinely used by clinicians and researchers to record brain activity noninvasively from the scalp. Transcranial magnetic stimulation is a noninvasive way of delivering stimulation to the brain to elicit a response. Its effect depends on where the coil is placed; in this case, it was placed directly over the brain region that controls a person’s right hand. By activating these neurons, the stimulation convinced the brain that it needed to move the right hand. Computer science and engineering undergraduates Matthew Bryan, Bryan Djunaedi, Joseph Wu and Alex Dadgar, along with bioengineering graduate student Dev Sarma, wrote the computer code for the project, translating Rao’s brain signals into a command for Stocco’s brain. At first blush, this breakthrough brings to mind all kinds of science fiction scenarios. Stocco jokingly referred to it as a “Vulcan mind meld.” But Rao cautioned this technology only reads certain kinds of simple brain signals, not a person’s thoughts. And it doesn’t give anyone the ability to control your actions against your will. Stocco said years from now the technology could be used, for example, by someone on the ground to help a flight attendant or passenger land an airplane if the pilot becomes incapacitated. Or a person with disabilities could communicate his or her wish, say, for food or water. The brain signals from one person to another would work even if they didn’t speak the same language. Their research was funded in part by the National Science Foundation’s Engineering Research Center for Sensorimotor Neural Engineering at the UW, the U.S. Army Research Office and the National Institutes of Health. For more information, contact Rao at rao@cs.washington.edu or 206-685-9141, and Stocco at stocco@uw.edu or 206-685-8610. Video and high-resolution photos are available on the research website. 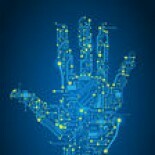 This entry was posted on August 28, 2013 by techinamerica in SCITECH, VIDEO.